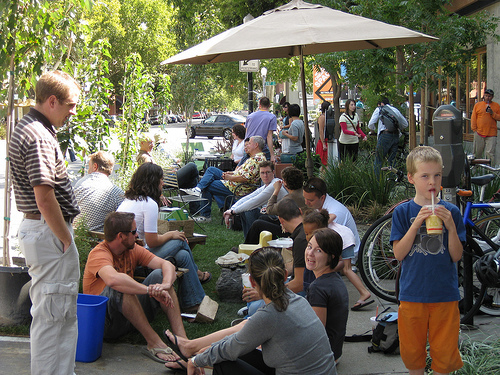 PARK(ing) Day has returned to Sacramento for 2009! Join us at the corner of J and 20th in Midtown on September 18th from 7:30A-6:00P. We will again be converting a car parking space into a beautiful mini-park called Presley Park. This year we will be taking a “Stone Soup” approach to the park, where people can bring whatever they feel makes a good urban park. We’re looking for things like chairs, tables, benches, plants, chalk (for chalk art), art pieces, musical instruments–whatever you can dream up and bring to the park. Why are we doing it, you ask? Well, contrary to what a local media outlet inferred last year, we are not a bunch of pot-smoking, hippie environmentalists looking to eliminate cars. We are a group of regular citizens, businesses, and non-profits that would like to see more urban space dedicated to parks and less space dedicated to the automobile. Did you know that in most cities roughly 70% of outdoor space is dedicated to the private vehicle? And while many consider Sacramento to be a “green” city, only 7.6% of the city is dedicated to open space for its people. Those figures are not acceptable to us! Our goal is to educate others about the importance of green space in cities, and shock some people by demonstrating everything you can fit into one parking space. Some spaces are about 168 square feet in area—even larger than some families’ bedrooms! For more information on how this idea came about, visit the National Parking Day website. Original concept by REBAR.